I’m normally an early riser but the dark forbidding clouds on Sunday morning seemed the perfect invitation to stay on the pillow. A quick glance over the hill showed a patch of blue sky so I got inspired and headed off to the Camden Car Show. 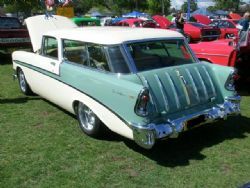 Hosted by the 55-56-57 Chevrolet Club of Australia the event is open to all classics, customs and bikes and mixes a country atmosphere within reach of the city. After an hour and half of motorway cruising I finally arrived and cut a track to the coffee vendor to freshen up after the trip. At nine thirty in the morning a good selection of classics and bikes were already lined up on the Camden Showgrounds and entrants were still arriving till late morning. As expected, there were plenty of tri five Chevrolets to purvey and a number of car clubs were well represented. 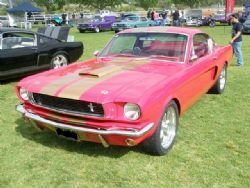 The Ute Club, Mustang Club of Australia and the American Muscle Car Club were just some in attendance. 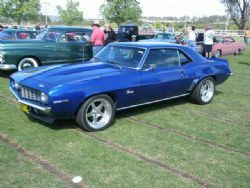 Cars ranged from local Holdens and Fords, American muscle, a few rods, custom choppers and some well restored older classics. There was plenty to see and do and the event catered for the whole family. Dad, along with any car crazy family member needed a few hours to get around and see all the machinery on the grass and the kids had a choice of an animal farm, face painting, jumping castle, motorised ride on cars, bungee and plenty of other kids to play with. There were a number of trade stalls and food vendors but the stars were the cars and bikes. I had seen some of the cars at Motorex and other shows and overall the standard was very high. It would have been a fairly daunting task picking any winners but at the end of the day anyone walking away with the silverware would have been very happy. There were a number of concourse restored examples, mild to wild customs and tastefully done restomods. The Car of the Show award went to a red midyear Corvette sporting an LS7 Z06 engine, huge rubber hidden under even larger flares, tricked up interior and a host of other custom and aftermarket touches. 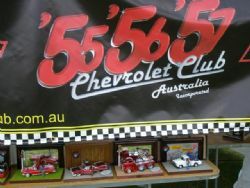 The Chev Club had a tent set up and had on offer the best looking trophies I had seen at any car show. The trophies were model cars mounted on a themed background and there were a large number up for grabs covering a range of classes for both bikes and cars. Very impressive. All in all a great day out and with the exception of the worst steak sandwich I have ever attempted to eat it was well worth the effort in getting there and the 55-56-57 Chev Club did a great job pulling this event together. It will be on again next year so if you live in and around Sydney and you have never been to this event do yourself a favour and put it in the diary.